Annie Ferder’s June show of new paintings at Tumalo Art Co. —Micro Modern Botanicals, opens during the First Friday Gallery Walk, June 2, from 4-8pm. Painting in her award-winning luminous, photo realistic style, Annie’s new botanicals are thoroughly modern, becoming even more dramatic in large format. 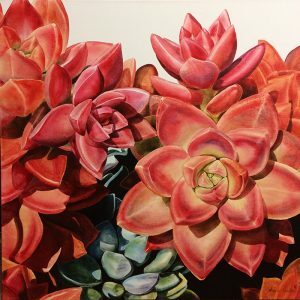 Big paintings of botanicals were the hallmark of Annie’s work two decades ago, and now she is working with the acrylic medium, painting on gallery wrap canvases, allowing backgrounds to stay pearly white. Two of Annie’s new pieces are acrylic on watercolor canvas, and framed. Exquisitely designed lines and shapes featuring extraordinary attention to detail allow the subject to take center stage, feeling fresh and immediate. 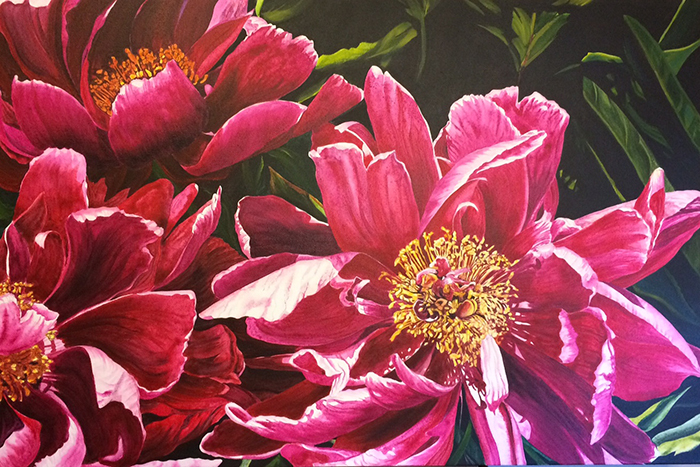 “Drake Park Peonies”, an acrylic on canvas by Annie Ferder. All but one of the paintings have white backgrounds. Drake Park Peonies has a black background, adding to the drama of the three Peonies, named so because the flowers were found in a garden across from Drake park. “Each year, I keep my eye out for places rich with flowers and fauna, taking notes and making dates in my calendar to revisit them in the future,” says Annie. Tumalo Art Co. is an artist-run gallery in the heart of the Old Mill District in Bend, Oregon. Please call 541-385-9144 for more information or check out our website.